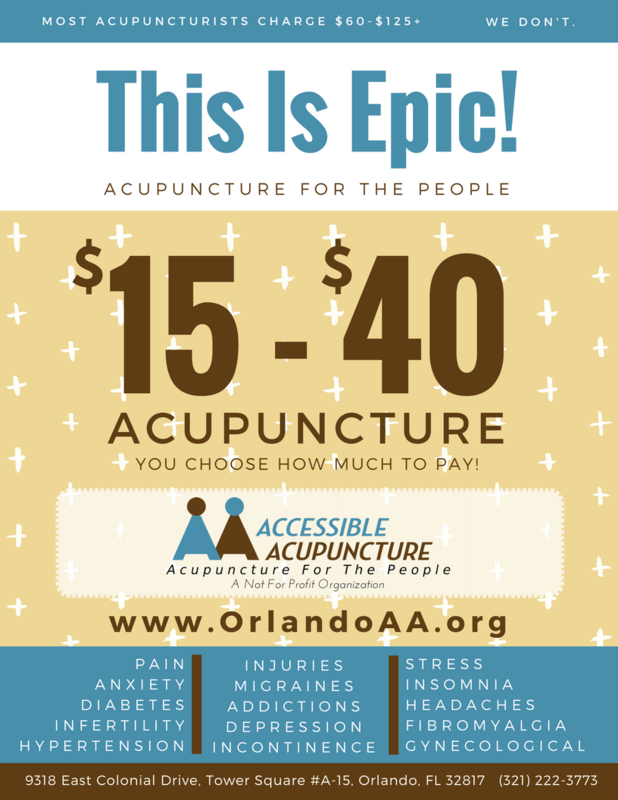 Accessible Acupuncture — Support The Healthcare Revolution! We're definitely worked up, but we're not violent. No torches or pitchforks necessary. Although we're pretty worked up about the rising costs of healthcare and the status quo that's made acupuncture inaccessible to most of our neighbors, you can extinguish your torches and put down your pitchforks. This isn't that type of revolution. Instead, we've joined The Calmest Revolution Ever Staged to put acupuncture within reach of our neighbors. Our community. We invite you to review some ways to Join the Revolution! Together, we can revolutionize healthcare in our community. It's the best (and most relaxing) way to Join the Revolution & help extend our roots deeper into the community. By receiving acupuncture, you're helping to maintain our lower pricing and establish a sustainable business so we can help others now and in the future. And when people ask why you're so happy, that's your golden opportunity to tell them all about us! Tell A Friend, Bring A Friend! Know anyone who could really use some acupuncture? Yeah, we thought so. Who couldn't use it, right? As you've probably experienced yourself, people tend to be less angry, less stressed and more easy-going, forgiving, patient, and pleasant to be around after receiving acupuncture. It's pretty much better for all of us if more people get acupuncture! So do your part to make this world a better place & introduce others to the OMG-that-was-so-incredible-I-can't-believe-I-survived-this-long-without-it goodness that they're missing. 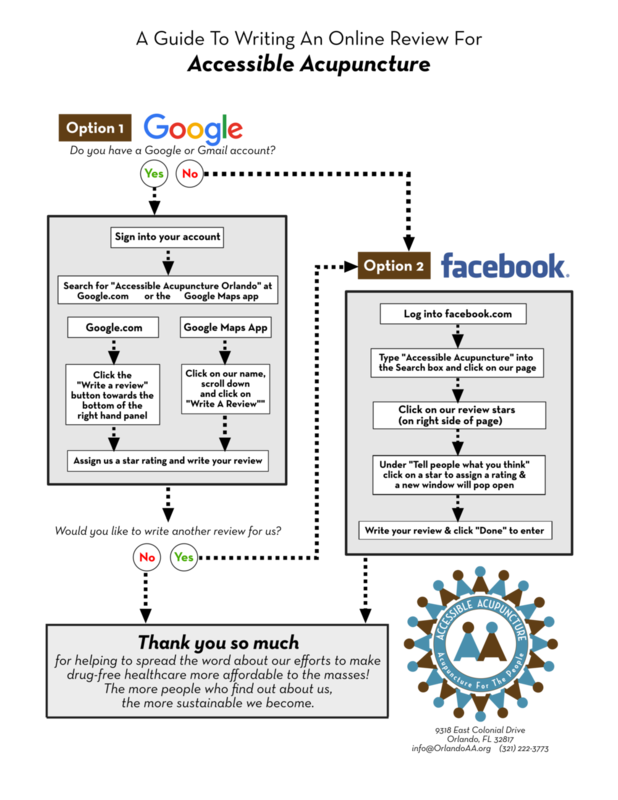 One of the best ways to help spread the word about your favorite low-cost community acupuncture clinic (and quite possibly, the best deal in Orlando) is to post an Online Review on Google of Facebook. Not sure how? No problem - just follow the simple steps in our Guide To Writing An Online Review For Accessible Acupuncture! You can also pick up a copy at the clinic - in the hallway leading to the treatment room. What should you write? When writing your review, put yourself in the shoes of someone who may be skeptical, or on the fence about acupuncture. Share your experience including, perhaps, how you overcame any reservations you may have had (i.e. cost, needles etc) and how acupuncture has helped you. Doing so might be just what someone else needs to put them at ease and motivate them to check it out for themselves! Do you know of a place with a community bulletin board? Perhaps there is a place to post a flyer in the employee lounge at the office? Stop by the clinic to pick up some flyers and mini-flyers or Contact Us and request a pdf for you to print yourself! * As much as we’d love to see our flyers plastered all over the next space shuttle, a Lynx bus or your favorite watering hole, please be respectful and courteous when posting our flyers. Ask permission whenever applicable and, if in doubt about it being an appropriate location, just don’t post it. Do you shop at Amazon? If so, you could participate in the AmazonSmile program - a simple and automatic way for you to support your favorite local charitable organization (ahem – we suggest that might be us!) every time you shop, at no additional cost to you. When you shop at smile.amazon.com, you’ll find the exact same low prices, vast selection and convenient shopping experience as Amazon.com, with the added bonus that Amazon will donate a portion of the purchase price to The Accessible Acupuncture Initiative, Inc. (that's our formal name registered with the IRS, but it should come up if you search Accessible Acupuncture)! Occasionally we may be in need of supplies, furniture, services or whatever and will list them below. Since we are a 501(c)3 tax-exempt organization, you may be able to deduct the fair market value of your donations on your tax return. * As part of our outreach programs, Accessible Acupuncture provides presentations on acupuncture and/or chinese herbal medicine to interested groups or organizations. We can also customize a presentation as necessary to align with the particular group’s focus. Just share our contact information with them or provide us with contact info (things tend to work better when we have the name of an insider), plus a brief background description of the group you have in mind. * Know of any Community Events where we can introduce the benefits of acupuncture to our community? Let us know! One great thing about acupuncture is that it’s incredibly ‘transportable’ with very little required to bring acupuncture to wherever folks may already gather, such as community spaces, nursing homes, hospitals, rehabilitation and counseling centers, schools etc. Our long-term vision is for Accessible Acupuncture to operate satellite clinics that operate on a regular basis in these kinds of spaces in order to make acupuncture even more accessible to our community while keeping our overhead low. If you know of any such locations or organizations that might be interested in working with us to establish a satellite clinic, please Contact Us with their contact info. We are proud members of the People's Organization of Community Acupunture (POCA) a not-for-profit multi-stakeholder coop working to make acupuncture affordable and accessible for communities like ours across the country. As a clinic member of POCA, Accessible Acupuncture abides by stringent POCA guidelines for maximizing public access to our services such as maintaining low fees, being forthright about our fees and providing consistent operating hours. The simple truth is that without POCA our clinic probably wouldn't even exist. Pretty cool, huh? What's even cooler is that you, too, can join The Calmest Revolution Ever Staged! because POCA is not just for clinics and acupuncturists. Community Acupuncture patients are invited and encouraged to join POCA as well. In fact, POCA has about twice as many patient members than acupuncturist members, and we think you'll agree that, just like yourself, the membership benefits are pretty darn awesome!